Best known for his large-scale, dramatic Alpine scenes that depict nature at its most sublime, Alexandre Calame was considered the leading Swiss landscape painter of the 19th century. Born in Vevey, Switzerland, on the banks of Lake Geneva, in 1810, Calame was deeply committed to his native landscape. As a devout Calvinist, he saw his subjects as expressions of the divine. He was also associated with the Düsseldorf school of painting that advocated working en plein air. Calame began his artistic career hand coloring engraved landscapes, which he sold to a thriving tourist industry. In his spare time, he drew small views of the Swiss landscape. 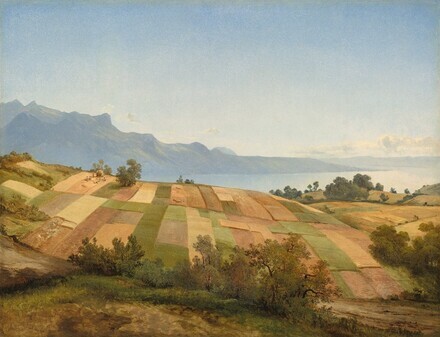 In 1829, the 19-year-old artist met his patron, the banker Jacques Amedée Diodati, who, recognizing the boy’s talent, provided the means for him to study with François Diday (1802–1877), a prominent Swiss landscape painter. Along with his mentor Diday, Calame’s name became synonymous with the then-fashionable Swiss Alpine genre. His works were exhibited, collected, and prized among discerning collectors. In Swiss Landscape, Calame plays against the very conventions upon which he based his career. In lieu of dramatic vistas of the Alps with snowcapped peaks, he presents a quieter view of the Swiss landscape: idyllic and picturesque rather than sublime, inhabited and tamed by people rather than denying their very presence. The overall effect is inviting and soothing rather than forbidding and awe inspiring. Among the fields, in varying degrees of cultivation, is a group of harvesters and a cart laden with freshly mown hay behind them. There is a strongly geometric quality to the landscape, neat and orderly with a patchwork of greens and golds like a handmade quilt. This geometry is echoed in the mountains and lake that have been simplified, abstracted down into shapes formed of color. In this painting, Calame does not celebrate the power of nature, but rather its quiet, subtle beauty bathed in a gentle radiance. Despite the popularity and demand for his work, Calame, like many artists of his generation, kept paintings that were never intended for the public in his studio. A year after his death in 1864, the contents of his studio were sold at auction. The sale consisted of nearly 500 paintings and studies, as well as more than 100 watercolors and drawings. We can imagine Swiss Landscape as one of those works. An intimate and private painting, unusual in both scale and subject, it is a personal tribute to the place that he held in such esteem throughout his career. Antoine de Cheneviere, Switzerland, in his family since the 19th century; purchased 21 March 2003 through (Hazlitt, Gooden & Fox, London) by NGA. Conisbee, Philip, and Franklin Kelly. "Small is Beautiful." National Gallery of Art Bulletin, no. 34 (Spring 2006): 2-17, fig. 8.